Dye sublimation is the method of applying an image to specially coated products and polyester based materials, using a combination of sublimation ink, heat and pressure. The application of print to material is initiated by heat and controlled with pressure and time. The recommended Polyester content is 100% - you can use fabrics with less Polyester content however the print will appear paler and will be less colour fast when washed. The print is applied to the polyester based fabrics using a Heat Press. The largest Heat Press at WSA is located in Room 2045E. Maximum dimensions are 140 cm x 80 cm. PLEASE NOTE: induction is required before using this equipment. Files can be complete images or supplied as a repeat. Files can be any size - please specify dimensions in Snowhite message box. The price of print is for the full width of roll 1000mm. Please note maximum size of heat press. The recommended colour space for this printer is sRGB. If using Photoshop, you should ensure your file is FLAT. 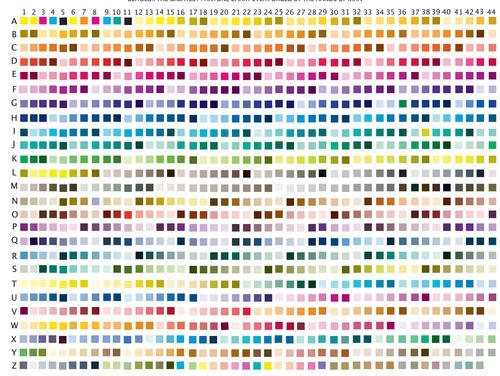 The file below is printed onto sample fabrics in Creative Services it can be used to colour pick colour swatches in Photoshop and the RGB colour breakdown used to match in your digital artwork. Remember the colour on screen is not necessarily the colour that will print on the fabric it is recommended that you do a 10 cm colour test strip prior to a full print. Click on the image to download.